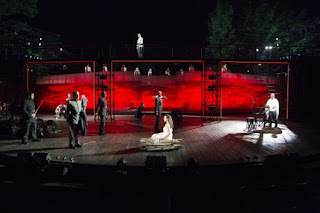 A thickly hot night at the Delacorte Theater vaguely threatened to storm all evening, with the occasional stiff breeze suddenly ceasing as thunder rumbled. Or was it thunder? A tumble of instruments sat stage right, a great many of them shouting and singing at the touch of percussionist Arthur Solari. 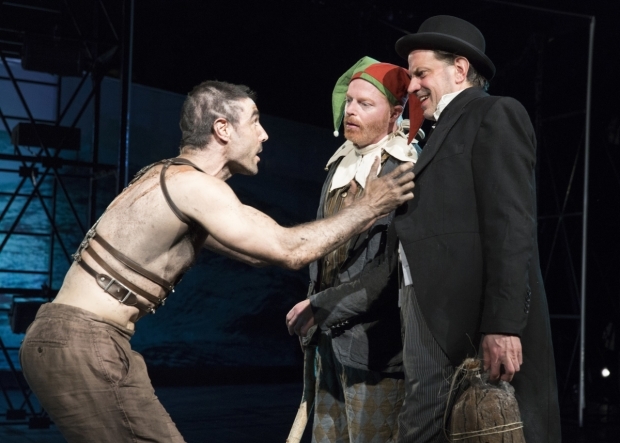 His finely tuned playing accompanied a tempest of a different sort in The Public Theater’s first production of Shakespeare in the Park’s 2015 season: William Shakespeare’s The Tempest. The flashing lights (designed by David Lander) and booming drums of the plays’ opening storm were startling and grumbled sporadically throughout the evening leaving the weather and the story on edge. Riccardo Hernandez’s set was functional in iron, hemp, and wood, bare catwalks with steps and ropes, augmented by a spiral staircase adding to illusions of airborne characters in the play. Prospero and Ariel. Photo Credit 2015 Joan Marcus. 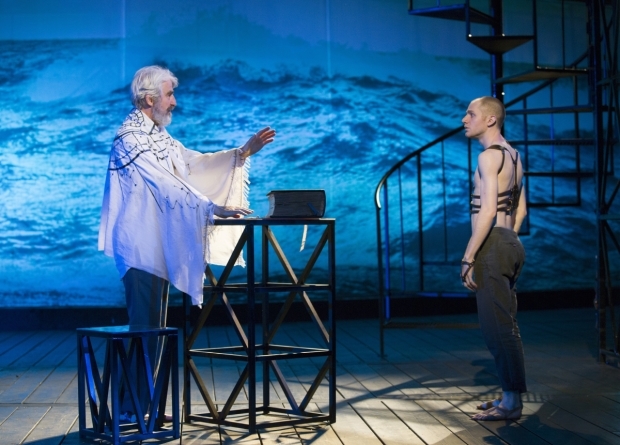 This summer’s production is the second time Sam Waterston has played Prospero — the first was almost 40 years ago. He is clear, engaged, and irascible. His skilled phrasing presents us with the poetry of the play at its best. On occasion he seemed to strain to push the words out, while some sections ran together in my ears. Mr. Waterston is a crotchety Prospero until he takes the noble step to not only make peace with those who usurped his dukedom 12 years before, but to forgive them, a totally believable transformation in a man whose anger is spent and who now knows his daughter is safe and loved. 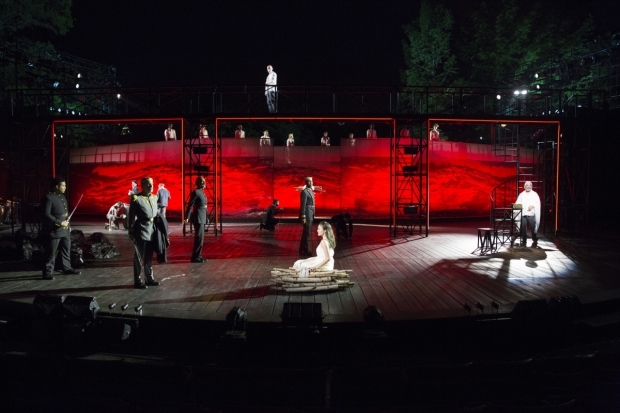 The Tempest at the Delacorte. Photo credit Joan Marcus. Francesca Carpanini plays Prospero’s daughter Miranda with sweet innocence, rendering the character’s most famous lines quite well. Only the love scenes came off as dully as they are written (sorry, Will) opposite a competent but uninteresting Rodney Richardson as Ferdinand, son of the king of Naples. Charles Parnell played the kingly co-conspirator Alonso sternly and well. Cotter Smith did solid work as Antonio, the brother who betrayed Prospero and now encourages Sebastian (Frank Harts), the brother of King Alonso, to repeat history and augment it with murder. Bernard White was an engaging Gonzalo although he appeared, 12 years after Prospero last saw him, to be much too young for Prospero to refer to him as “the good old man.” Louis Cancelmi as Caliban was anything but deformed except in his odd speech. the scruffily hilarious Danny Mastrogiorgio as Stephano. The oft-dreaded (by me) supernatural ceremonials called for by Prospero were some of the best I’ve ever seen. The dancing and singing of melodious music by Michael Friedman blessed the ceremony of union orchestrated by spirits — Tamika Sonja Lawrence’s Ceres introduced the exceptional Olga Karmensky and Laura Shoop singing as Iris and Juno respectively. The choreography by Denis Jones was lilting and adventurous and allowed the Ensemble to shine as sprites of the island. These fantastical rites were so magically beautiful I was rapt and happy in them. Michael Greif’s production was a touch uneven, leading me to wonder if it would have been as pleasurable an evening had this production been done indoors, absent the atmosphere of Central Park, the breeze through the trees, the view of Turtle Pond and Belvedere Castle beyond the set ….we will never know. The play filled the Delacorte Theatre, running about two hours forty minutes with nary a drop of rain. A fine night out in Central Park at the Delacorte celebrating Shakespeare. ~ Molly Matera, signing off to re-read the enchanting verse of this oh so quotable script.